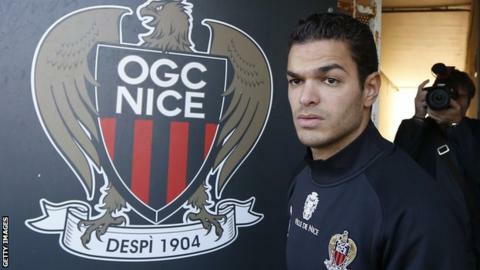 Hatem Ben Arfa's lawyer has hinted the midfielder could retire from football after the French Football League (LFP) barred him from playing competitive games with Nice. The 27-year-old joined the Ligue 1 side from Newcastle earlier this month after a loan spell at Hull was cut short. Fifa say players can only play official matches for two clubs in a season. "In the back of his mind there is the possibility to quit," Jean-Jacques Bertrand told Infosport Plus TV. "His stay in Nice will end tomorrow. It is out of the question that Hatem will finish his season at Nice." France international Ben Arfa scored for Newcastle in a 5-2 win over Reading Under-21s in August before going on loan to Hull, where he played nine times. His loan spell with the Tigers was ended early by manager Steve Bruce and he moved to Nice on a free transfer. The LFP asked football's world governing body for clarification on the status of the Under-21 Professional Development League, where three over-aged outfield players are allowed, before making an announcement. Fifa told the LFP that the under-21 league games had to be considered as official. "In application of the decision, the LFP has no other choice but to ban Hatem Ben Arfa from playing official matches with Nice until the end of the season," a statement said. Fifa regulations state that "players may be registered with a maximum of three clubs during one season. During this period, the player is only eligible to play official matches for two clubs".